These are empty eggs of quail from my own farm. Despite all if there is a a broken egg in a transport, I will resubmit it for free! These are empty eggs of quail from my own farm. They are very carefully drilled on both sides and properly cleaned and washed! Despite all if there is a a broken egg in a transport, I will resubmit it for free! The simulation is high, and there are two patterns on one egg. Applicable occasions: party, masquerade, wedding, Easter, etc. If you buy it back, you can directly graffiti it. It’s really good. Fully matched, each bag has 4 colored brushes and an egg. That is the extent of my knowledge about these. Look at the pics and decide for yourself. I have 5 boxes of three already sealed up. You will get 3 eggs from the pics. A good mix in each box. They hope you will decorate their eggs and enjoy them! This Emu Egg was laid by one of my emus. There is a small hole at the bottom of one end where the inside of the emu egg was removed. The emu egg has been washed. EGGcellent for etching crafts. This sale includes one emu egg. This is the collection of three rhea eggs that are blown out for craft purposes. The collection includes one egg that is cut out on two sides with a design and has a third side with a design in pencil started on the shell. 24 Pappeier weiß. Die Ostereier können beklebt oder mit Stiften und Farben bemalen werden. Diese Ostereier können Sie nach Ihren Wünschen gestalten. Lot of 18 assorted egg shell with blow holes. One of the eggs has penciled oval for a cut-out. They can be used to create your own unique jewelery boxes. The eggs will have a single hole less than 2 cm at one end. The color of natural ostrich eggs varies from white to off-white. 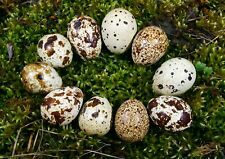 These eggs were produced from ostrich hens living a good life in a pasture setting. The hole is strategically placed so it's not too obvious. 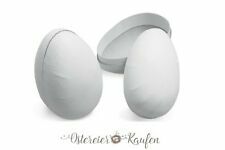 Füllbare Ostereier aus Pappe „ Stilvolles Ostern“. Preis pro Set ohne Deko! 3 Motive sortiert. 6 Gänseeier zum Aufhängen. Wir führen Ostereier in verschiedenen Variationen und vielen Osterdekorationen. Mit Juteschnur zum Aufhängen. 10 Pappeier weiß. Die Ostereier können beklebt oder mit Stiften und Farben bemalen werden. Diese Ostereier können Sie nach Ihren Wünschen gestalten. 6 Hühnereier zum Aufhängen. Wir führen Ostereier in verschiedenen Variationen und vielen Osterdekorationen. Preis ohne Deko! Acrylglas Ring geeignet für große Eier (Straußeneier). Wir führen Ostereier in verschiedenen Variationen und vielen Osterdekorationen. Number the eggs and put clues inside the eggs with rolled up paper. When kids find the egg they have to smash it to find out the next clue. What FUN! The eggs have been rinsed with water inside and out. Lot of 16 mostly neutral Sulky Rayon Embroidery Threads. Lot of 18 assorted egg shell with blow holes. 12 LARGE "blown chicken egg shells. Buy these shells now and go straight to doing the things you want to do with egg shells. These eggs have only one small hole and have been rinsed with water inside and out. 1 Osterei aus Aluminium in Kupfer stehend. Stehendes Ei auf Holzsockel. Buy these shells now and go straight to doing the things you want to do with egg shells. These eggs have only one small hole and have been rinsed with water inside and out. Buy these shells now and go straight to doing the things you want to do with egg shells. Egg arts & crafts, or an gleeful egg hunt where you have to smash the egg shell to get the next clue. Buy these Orange egg holders to display your decorated eggs. Nice clean, sturdy, well-shaped Ostrich Egg shell which has been blown out from one end with a 1/4" hole remaining. May or may not have minute remnants of tape on hole end. Great for carving or painting or just to admire as is. You will receive this exact dozen single hole blown chicken eggs laid by my girls. The blue-green ones are jumbo, laid by my Cream Legbar. The large khaki ones are laid by my Swedish Isbar, while the large whites are laid by a Leghorn. Rhea 11.75" round. Ostrich 16.5" round. Emu 11" round. Goose 6.25" round. Swan 9" round. They make a great gift for kids too! ~ Colors may appear lighter/darker due to monitor pixel variations. 30 LARGE blown chicken eggs. These eggs have been rinsed with water inside and out. Also they have only one small hole. Buy these shells now and go straight to doing the things you want to do with egg shells. Egg arts & crafts, or an gleeful egg hunt where you have to smash the egg shell to get the next clue. These eggs have only one small hole and have been rinsed with water inside and out. Weiße Gänseeier mit einem Loch. Floristik Qualität. Wir führen Ostereier in verschiedenen Variationen und vielen Osterdekorationen. Die Eier sind entleert und gereinigt. Preis ohne Deko! Buy these shells now and go straight to doing the things you want to do with egg shells. Egg arts & crafts, or an gleeful egg hunt where you have to smash the egg shell to get the next clue. Buy one of these egg holders to display your decorated eggs.